Each splendid beaded curtain is 35 inches wide and 70 inches long. 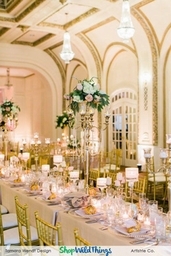 Use them alone or in front of fabric panels for a stunning, sparkling backdrop. Each curtain rod holds 34 strands. 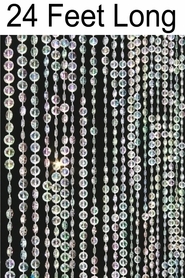 Each diamond bead is 1 centimeter in diameter. 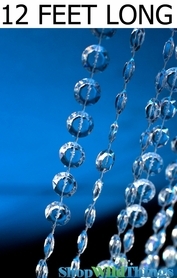 Because all beads are attached to the rod, it takes just two minutes using two nails or two small C-hooks. 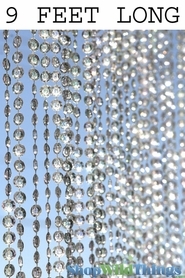 We're not exaggerating when we say how much our customers love these diamond crystal iridescent diamond-faceted crystal bead curtains from ShopWildThings. 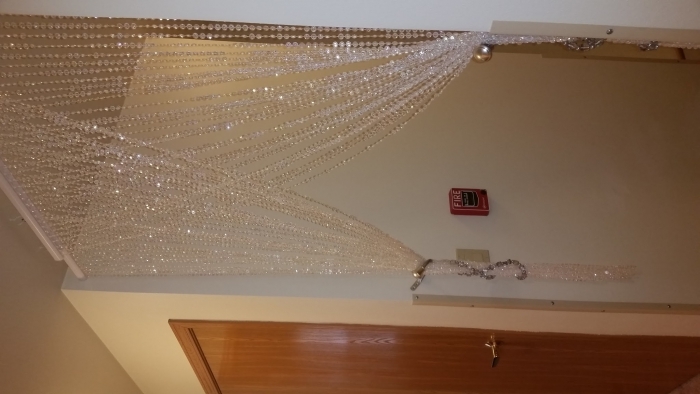 Scroll through all the rave reviews in the customer testimonials at the bottom of this page about these 6-foot-long acrylic crystal strands curtains. Shop our magnificent beaded lamps with the same iridescent color and our coordinating accessories to complete your perfectly matched look for that next memorable project. 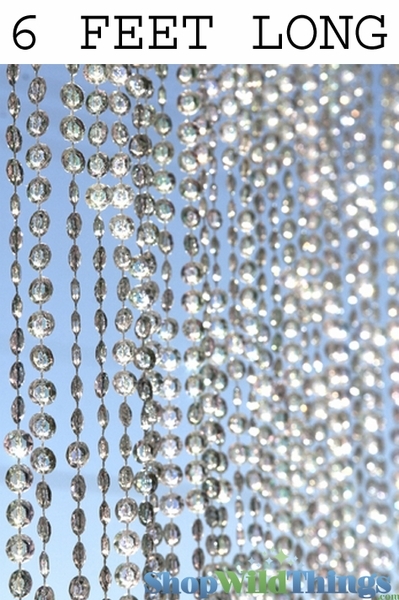 We carry beautiful coordinating chandeliers with crystal beads that sparkle like diamonds and dazzling ceiling canopies with diamond-bright faceted crystals. 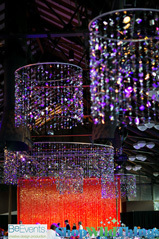 Our crystal Celebration Chelsea chandelier is 6 feet in length. 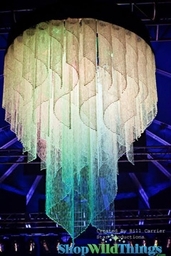 Our Falling Stars chandelier is 21.5 inches tall. Our pretty Quinn chandelier is 10 inches in diameter and 21 inches high. 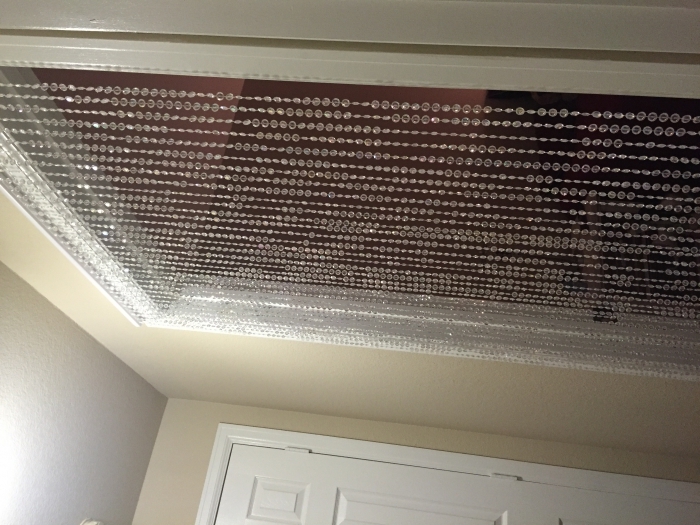 Our crystal diamond-faceted beaded ceiling curtains have easy-to-follow instructions for two-person installation. Buy diamond-look crystal beads by the bag. Each strand is 150 feet long. Our dozens of coordinating items included Room in a Box sets for the bedroom with the same crystals beads on curtains included with bed net canopies and matching hanging lights. 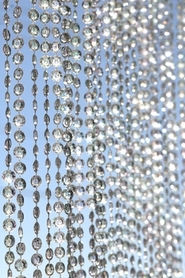 The gorgeous diamond crystal curtains featured on this page with strands of diamond-faceted iridescent beads have been featured on television shows like CSI: Crime Scene Investigation and Jimmy Kimmel Live. They're a favorite for movie productions, weddings, homes, special events and professional photo shoots, too. Our video on this page demonstrates how beautifully these crystals capture the light for a shimmering look. I really liked these beads. The shine is beautiful. 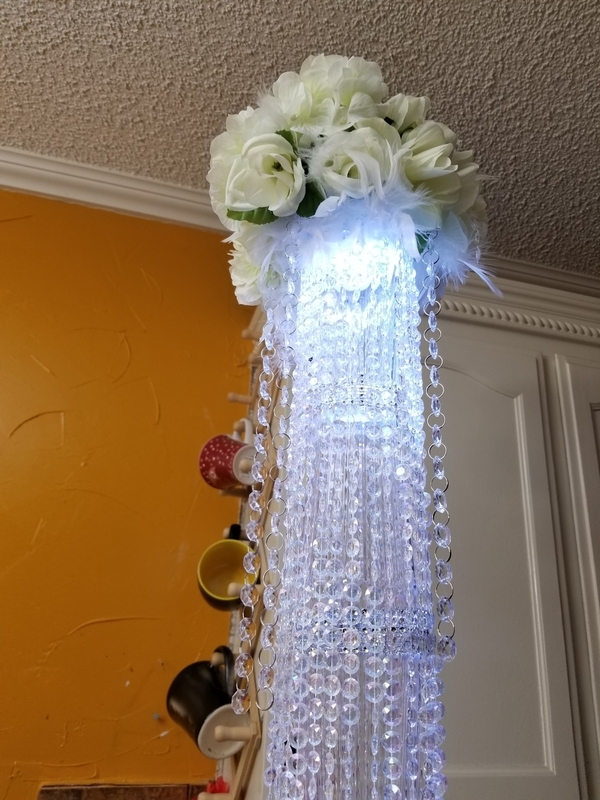 I used these curtain beads to make a lamp demo for my wedding. I loved the outcome! 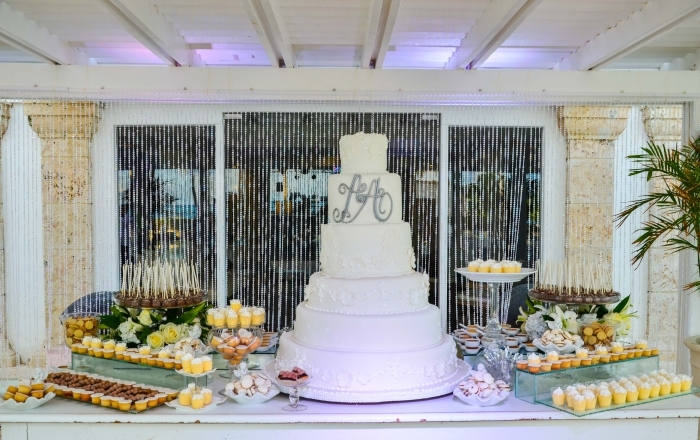 We love the effect we created in the dessert table. Merchant Response:Wow!!! Very elegant! Thank you so much for sharing. They were the perfect additional to my makeup room. Merchant Response:Thank you!!! 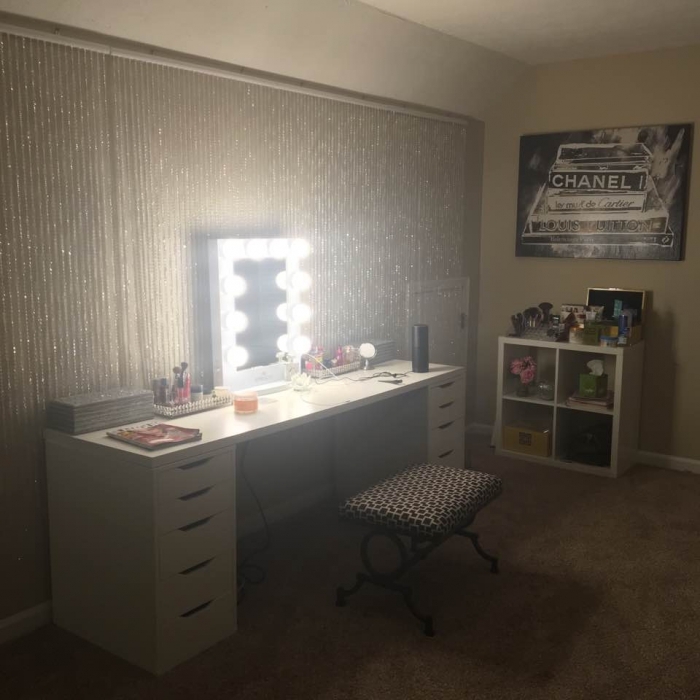 We Looooove your makeup area!!! Thank you so much for sharing your photos, it looks fantastic!! I was looking for a solution to protect birds from flying into my windows in the backyard. 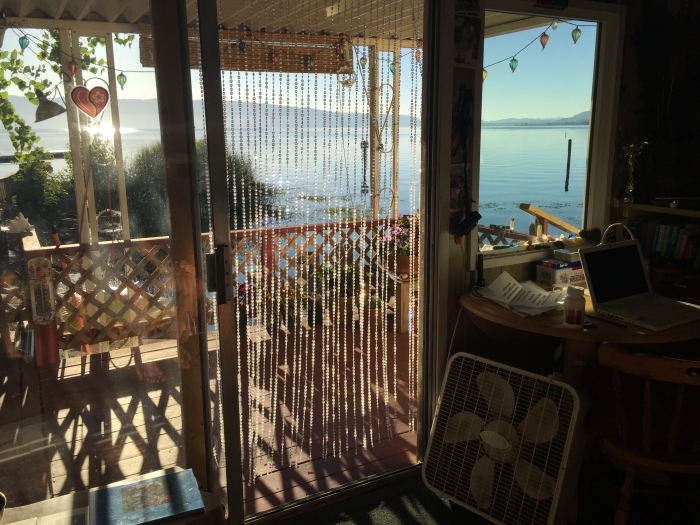 I tried numerous things and had a bright idea to get these beaded curtains to hang on the outside of my windows. I was concerned that they might inhibit our view but they don't at all and I love how the sun catches them in the afternoon. They're just perfect and my husband even said "they have exceeded my expectations" HA! I loved them so much I got another set for my other window. They don't impeed the view and they look great and best of all no more birds hurting themselves on our windows! See my basic pics! Merchant Response:Thank you so much for sharing your photos and great idea for protecting our feathered friends. We just love to hear what creative ideas come from our wonderful customers. Received more and better quality than I expected. At first I was somewhat skeptical but this company truly sells quality. What you see IS what you GET. Loyal customer here! 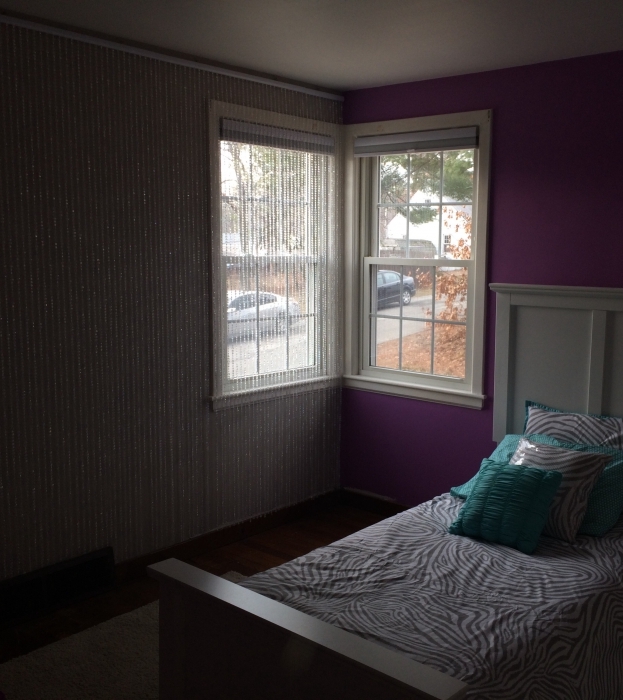 Added these curtains to the accent wall of my tween daughter's room. Packaged neatly, easy to hang with a couple of nails per curtain and I was able to custom cut final mounting piece without any issues. Bought these at 6' length and glue gunned additional strands to reach baseboard. Pictures don't do it justice-looks absolutely amazing! I used these curtains in an unconventional way. 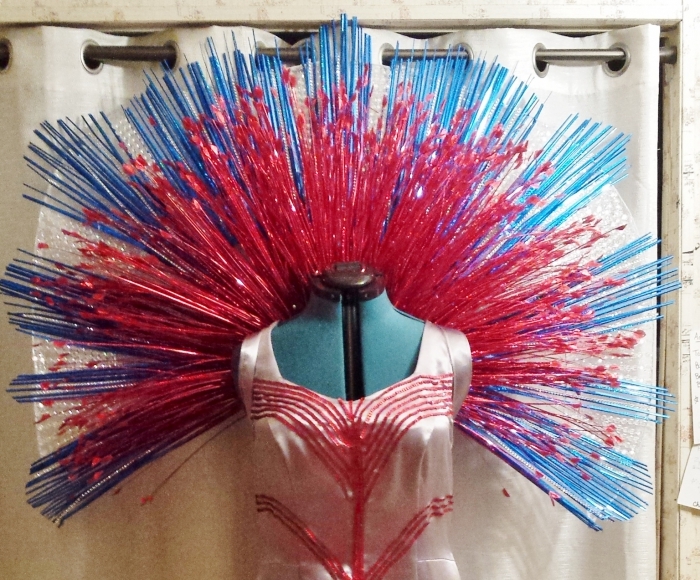 I used them to make a fireworks costume come to life with sparkle and pizzazz. What an incredible impression this made! I used three strands for the costume. I will be using the remaining strands as a divider in my bathroom. They are so beautiful and super sparkly. I will definitely be order more of these for parties and probably for other costume ideas. Thanks so much! Merchant Response:Wow! Thank you so much for taking the time to review this item and for sharing your creative use of the beads. We love to see how creative our customers are, fantastic! ProsThese are sparkly and beautiful. Very versatile for a costume designer like me. Wonderful for parties and so much more! 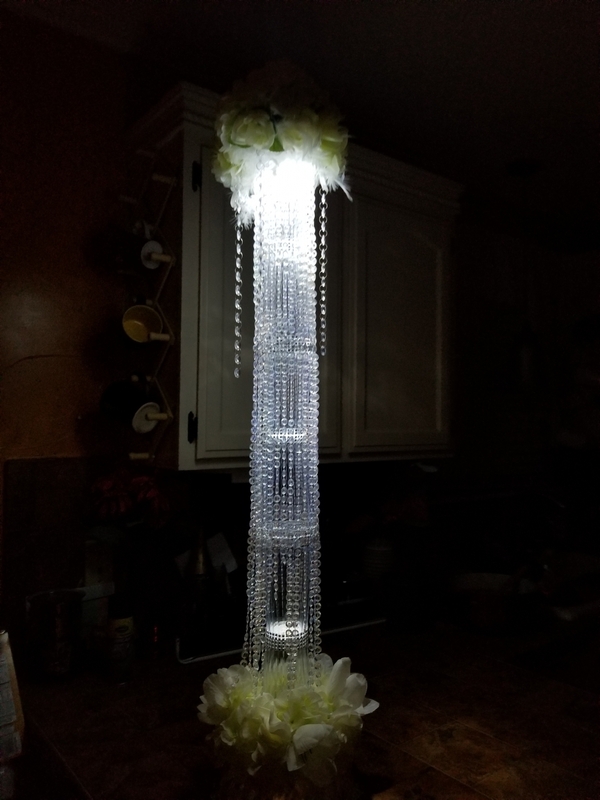 These were fabulous on my self-made lighted columns! Lots of compliments!! Merchant Response:Thank you for the photos and for reviewing this product! We do have a bendable option, too! 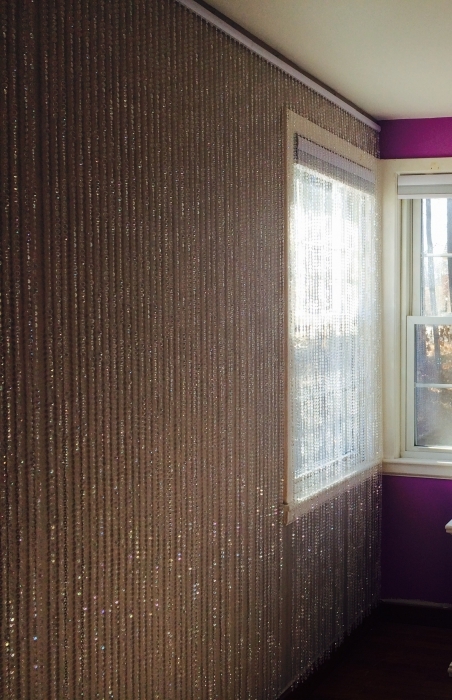 Our Crystal Columns can be used for a curved application, and we have this exact curtain on a Bendable Rod! We'd love to help you again. We appreciate you! ConsWish the rods were bendable. Really enjoyed the ease of use & the astounding variety of colors, shapes, material & lengths offered...If you can't find it here, it hasn't been invented yet! But I bet if you called their amazing Customer Service people (Like I had to because I wasn't really sure what I wanted) they can help guide you were you need o go. Merchant Response:Thank you so much Sharen for your praise and enthusiasm! We truly do have a caring staff that will go to every length possible to make sure our customers are taken care of. It feels good to know we've exceeded expectations and please don't hesitate to call regarding questions on previous orders or anything else! ProsSee review - Shop Wild Things is AMAZING! ConsIt sure would be nice if there was a way, on-line, to see what I've ordered before. I had to order a second curtain & I couldn't be remember exactly what I had ordered previously. I am a photographer so I purchased this curtain as a backdrop prop and I love it! I received it very quickly and everything was intact when I opened it. I definitely recommend this item! Merchant Response:Thank you for taking the time to send photos and write your review! We appreciate your business! The item is awesome for what I needed it for. My review is more for the customer service at Wild things that I received. 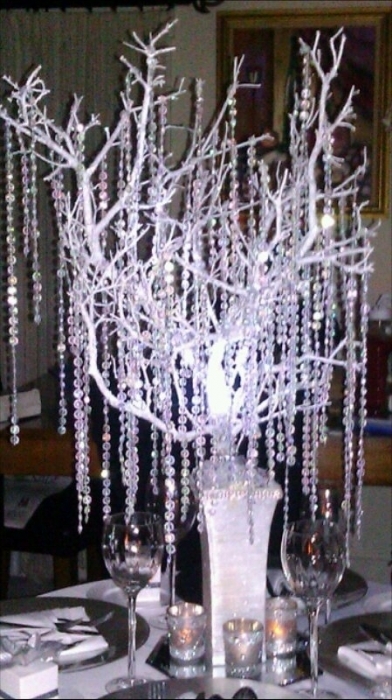 I needed the curtain to finish some crystal trees for an event that I was having. I ran out of crystals and could not find them locally. I called several places but they could not guarantee me overnight delivery by the day I needed them. I called wild things and they assured me that I would have them the day before I needed them. Not only did I receive them the next day but before the time promised. They saved the day and my neck!!! Thank you for your awesome customer service and I will always turn to you for my event planning needs. I can not thank you enough. Merchant Response:Wow! Thank you for taking the time to send this glowing review and also the amazing photos! We can't pay for press like this. Our staff is truly incredible and we appreciate your comments so very much. This diamond curtain is absolutely gorgeous!! And the customer service here @ shop wild things is phenomenal! Thank you so much for the fast delivery and beautiful product! Always satisfied with the prompt service. Since this is a Christmas gift for my daughter, I have not opened the beads; however, I have ordered this same item twice before and know that everything will be fine. I can always depend on accuracy and dependability from Wild Things. Outstanding effect! Love them! Easy to hang and rich looking! 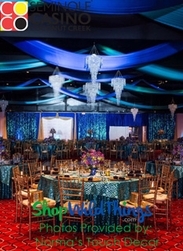 Purchased iridescent curtains to utilize for my ceremony and wedding. I wasn't sure what the product would look like but unboxing the curtain EXCEEDED my expectations. ProsEasy to hang. Only need 2 heavy duty "S" hooks. My beaded curtain purchased from ShopWildThings.com is hanging and perfect. The quality is great and I am totally satisfied with my purchase. Loved how easy my look came together when I received these bling curtains. I bought this as a backup to the mirror curtain that I purchased. Both fit perfectly and compliment the decor equally. 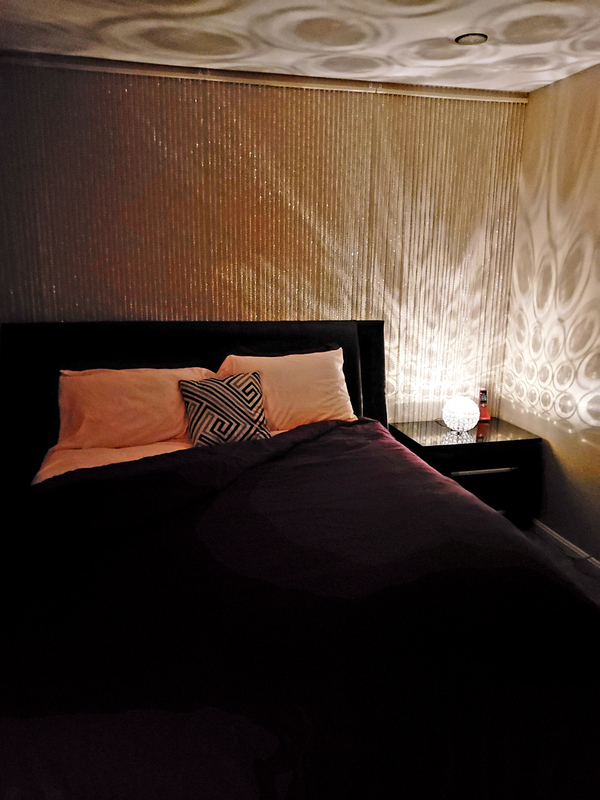 With two different styles, I can easily change the ambiance of the room and still have the classy look and feel. ProsBeautiful, easily adds versatility, easy-to-install, and perfect fit. Love this for photography ! I used the curtains as a back drop behind my bed. It looks so elegant and classy. So happy with this purchase. this product fits exactly the purpose I bought it for. Thanks for the wide variety you offer to us. Easy to hang, looks great, adds a sparkle to any room,wall,window and can be adjusted to fit different heights and spaces. I have two of these bead curtains in my hair salon. They look pretty and sparkle! Quality piece! I just love how colorful the beads shine from the sunlight or just light reflecting on them. 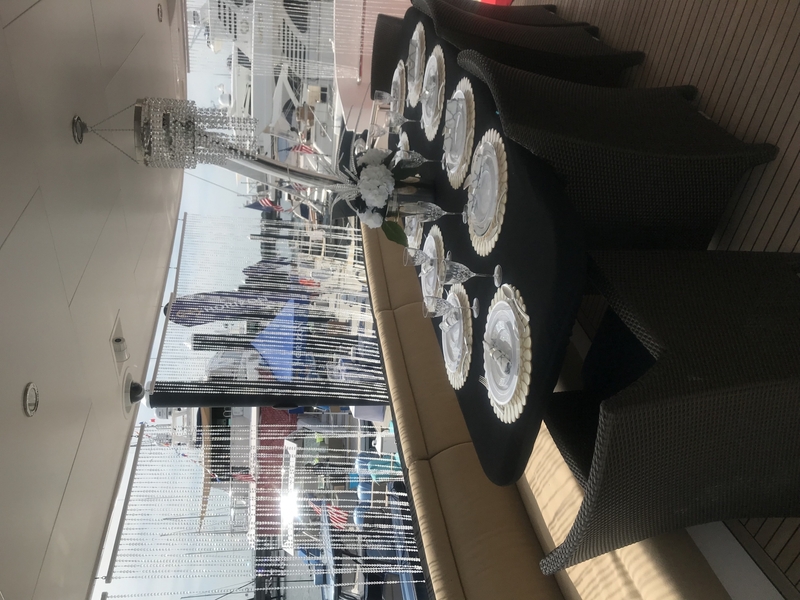 Outstanding effect draping the aft deck of the yacht. 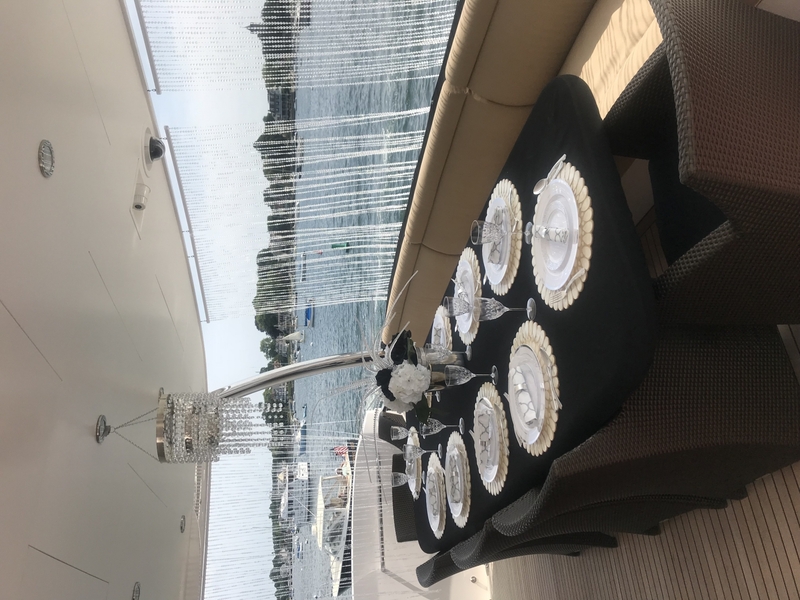 Together with a movk table setting & red carpet set the tone as guests boarded the yacht for the Roaring 20â€™s party. Merchant Response:What an incredibly cool idea! Thank you for sharing and for reviewing! AWESOME! 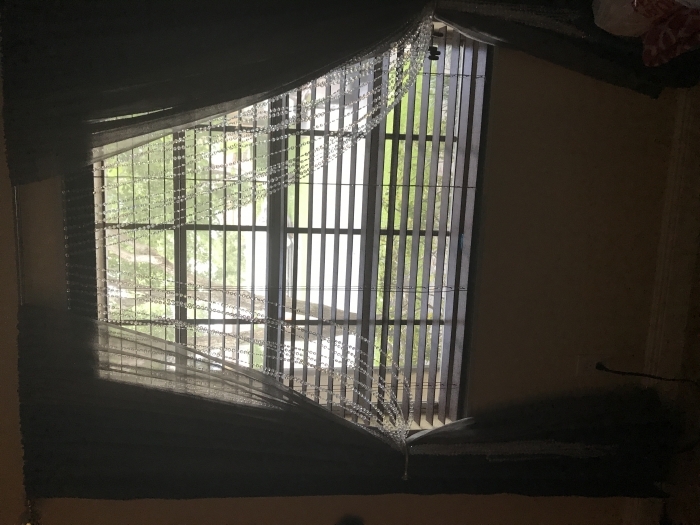 unfortunately the curtain I ordered did not fit the original spot I wanted to use the curtain for. I tried another door way and to my surprise it was the perfect spot. it was made for the door wayI used. So pleased with my purchase. 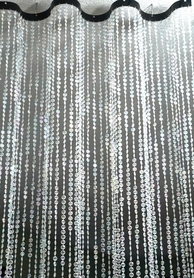 I absolutely love these beaded curtains , I will be purchasing more! hanging in front of my mirrored closet doors-so pretty! doers this item cone with a rod? How can they hang fron the ceiling. Do yuhiii need to purchase a rod seperate and assemble? Merchant Response:These come already attached to one rod. You just take them out of the box and hang them right up! Merchant Response:You are so welcome!! We love our customers and try to provide the best customer service possible. 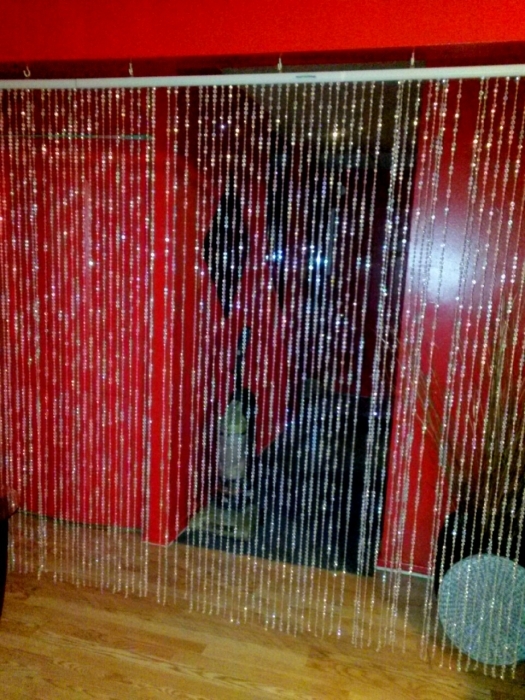 I'm very impressed and pleased with the quality of the beaded curtain. Exceeded my expectations! It was more than expected, the picture does no justice for how beautiful the diamond curtain really is. I love the product and especially the price. Wasn't tangled, was the perfect addition to my pre teens room. Very pretty. Would purchase again. I bought this for my grandaughters bedroom window. The product was perfect. It's beautiful and just the right size. The price made it even better. I would highly recommend. My product arrived broken and when I called, the CS agent was personable and VERY accommodating! I have NEVER had such amazing CS. I couldn't believe it... I asked her if I was getting punked and "what's the real deal?" Thanks for the amazing service... it's a lost art these days. Glad to know it still exists!! Merchant Response:Thank you so much for your kind words. We love our customers and do our best to take good care of them. 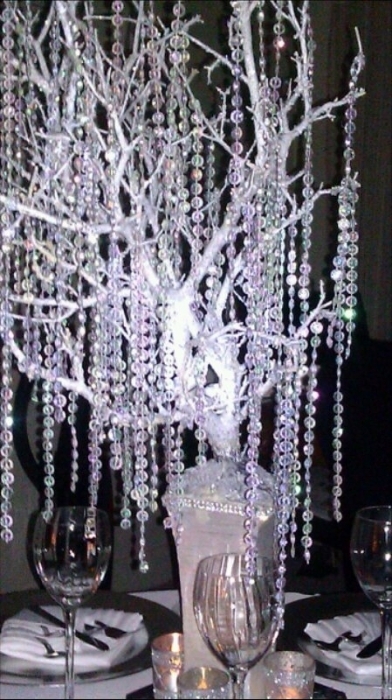 Used the clear crystal beaded curtains as decorations for our Halloween party themed "Studio 54's After LIFE Party". The effect was awesome. The bead quality and customer service was great! 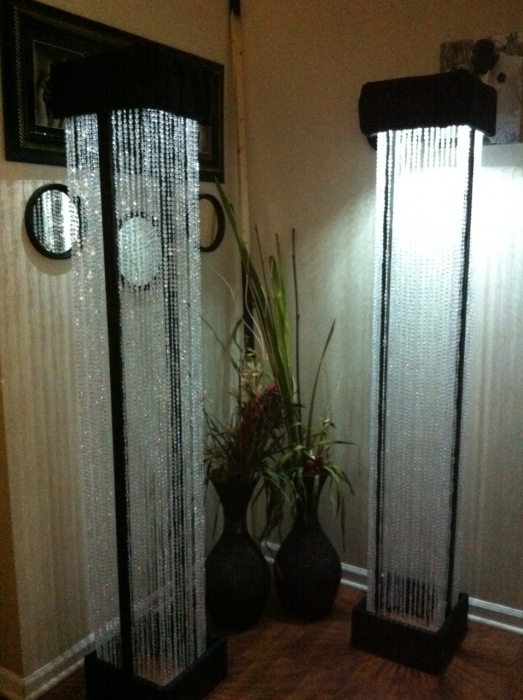 The beaded curtains are beautiful and are quality beads. The head rail is very sturdy. I was very pleased with the ordering process and the quick shipping. Shipping was fast and it added the touch I was looking to add in my daughter room. ProsQuick shipping and something different then what's available in the stores. 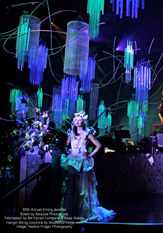 ConsThe diamonds was a lot smaller then the images on the website and the width of the curtains was to short. Wish there was more options as far as width. Force me to pull them back to the side. Delivery . Packaging and delivery notices were all five star as well as the product. I would definitely order from this company again. Worked perfectly for what I needed. I love the fact that I can use these over and over. Merchant Response:Thank you so much for your order!! We are so glad you found us too!! 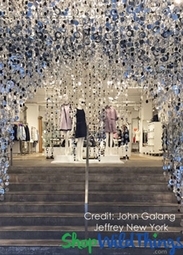 This was a great shopping experience. I would order from them again. Very sturdy and accent to the photo backdrop I'm using it for. I use the curtain as the back drop for my daughter's wedding ceremony and photos. Everyone love it. Received the beads in a well contained packaging. Our team starting putting them up, and the rodding made it easy to install. Most important, the value in price comparison was 2nd to none! Exactly as described. Will be able to use over and over. Delivery was timely. These are just what I needed for a narrow window in a room with lots of natural light. I only wish there was a length option between 6 and 9 feet. Merchant Response:Thank you so much for your order and for sharing your comments with us. 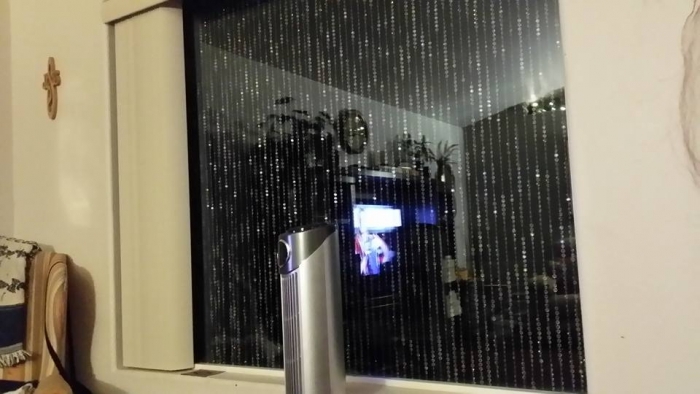 All of the acrylic beaded curtains can be cut. Just use a sharp scissor to trim the bead strands to the desired length. It's that easy. Enjoy your curtains! Lovely sparkly curtains. Well made .These are to hang over a French widow and are stunning in the sunlight . Perfect for our use. Easy to hang. We use this on the opening doorway to our covered porch to keep barn swallows from flying in and nesting on our porch light. It works great. The cat can still come onto the porch, but not the birds. Merchant Response:Awesome! We love our pets too and this is a safe way to keep the birds out. Thank you for taking the time to share your thoughts with us. Love this product - sooo easy to hang and looks beautiful - using in doorway between Master Bed and Bath. 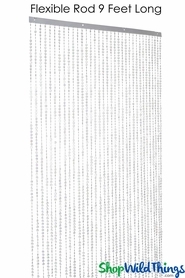 I was looking for a bug screen and then considered hanging beads. When searching, I found this at an acceptable price to try. It is Fabulous. We have a lovely view that we want to save and savor, so minimal view obstruction was part of the deal. The sparkling beads in sunlight and electric light add to our place and though we've had it only a short time, even if I need to repair or purchase more if we are too rough with it, it's still a great deal and we are very happy. ProsBought for bug screen--it works AND Beautifies!!! 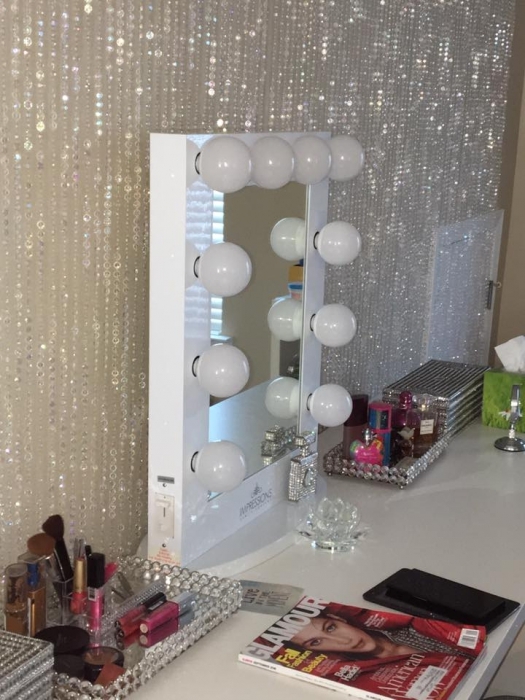 The pictures really do it no justice it's sooo pretty and goes with my diamond glam themed room! Just what I needed for my "hiippy" room at my shop (Tangeld Twigs in Ellicottville , NY). Customers love how the beads look like crystal! Shipping was quick! I'd order from this company again. They look pretty much as they are described here..Very pretty.. I love these beads. They are elegant and subtle, providing beauty to my living room and dining room. Just what o was looking for, fast delivery! They are so beautiful and sparkling I just love them. Everybody giving a lot of complement on them.Thank you for a wonderful product. 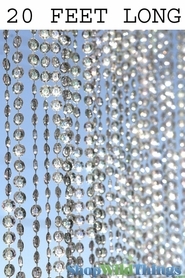 Made me do a happy dance when the afternoon sun made diamonds flicker all over the ceiling>>they fit perfectly in the space I purchased them for>>and soooo easy to hang. Looks just as good as the picture. Nice quality! I absolutely love these curtains. ..high end look at a budget friendly price! Not only did I receive t fast, it's absolutely gorgeous and can't wait to try it! The items I ordered were exactly as they appeared on the site. Shipping was fast and everything arrived in perfect condition. ProsEverything. This is a GREAT site. Easy to install and looks amazing! I hung it between my kitchen and dining room, which is decorated in 70s, it is a perfect addition! 12 year old daughter loves this! 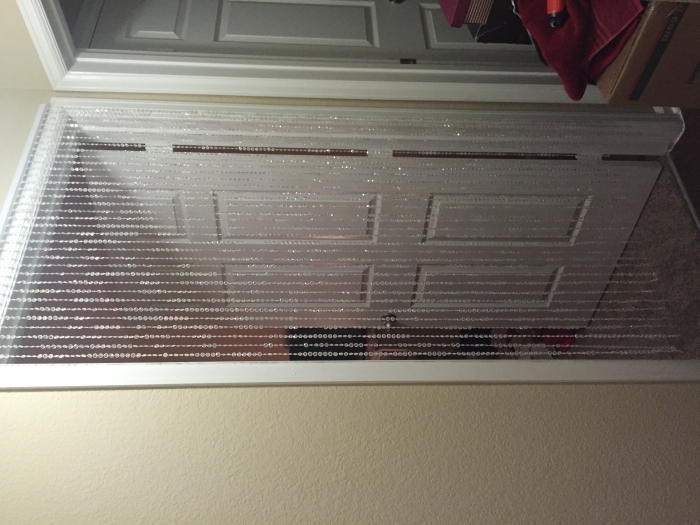 We bought this for our daughters birthday to hang over her closet door opening. Everything was packaged nicely and it was super simple to hang. She loves it and we are going to keep it in mind for gift giving. I purchased these to hang on my twigs that are going on my guest tables for my wedding. I want 10 3ft strands per table. One box gave me enough to decorate almost seven tables. I was short two strands. I simply took the beads off the curtain rod and cut them each in half. I am using silver Christmas hooks to hang onto my twigs. I purchased this size at this price because I believe I got the most bang for my buck. I called the company before making my purchase to ask some basic questions and they were all answered. I would order from this site again. Love the hanging mechanism on this beautiful set of doorway crystals. Hello, I have bought these beaded curtains three times. One I hung in the shower, then I got another an hung it behind my Christmas tree. But recently I needed a small room to do my sewing. I cornered off a a section of my living room and vola! I have my beautiful peaceful sewing room. These curtains are the best you can get. Super easy to hang, very strong strings of beads yet so delicate. 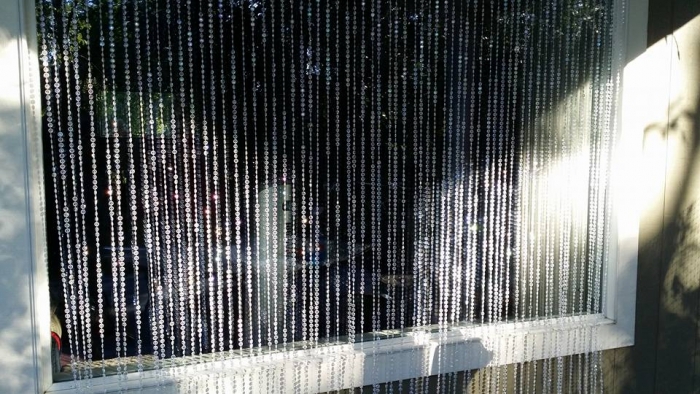 I love these beaded curtains have them hanging up on my sliding glass doors, beautiful when the sun shines the whole room shines. Brings a glow into the room love it easy to hang up wish I had another place to hang more of them up lots of compliments. 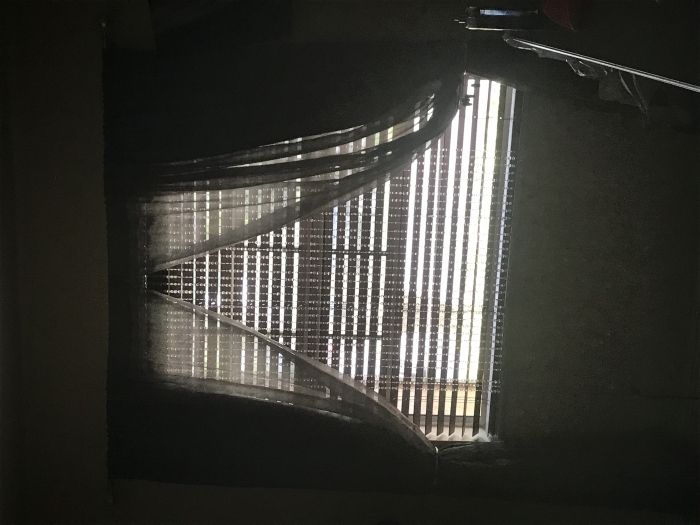 I love these curtains, they sparkle in the sunlight and at night when lights are on. I will definitely buy more of these for other windows! Perfect accessory for any location !! Prisms are reflected off of the sunlight. Very cool !! Cons2 small nails are all you need to install ! Crystal Curtains Rock the Prom!!! The Crystal Curtains we ordered from you were absolutely perfect for the prom this year. Speedy shipping and amazing products will keep us coming back to purchase from you in the future! I was going to give 4 stars because the crystals weren't clear like I expected, but then I looked up the definition of iridescent and realized they were exactly as described! ha. 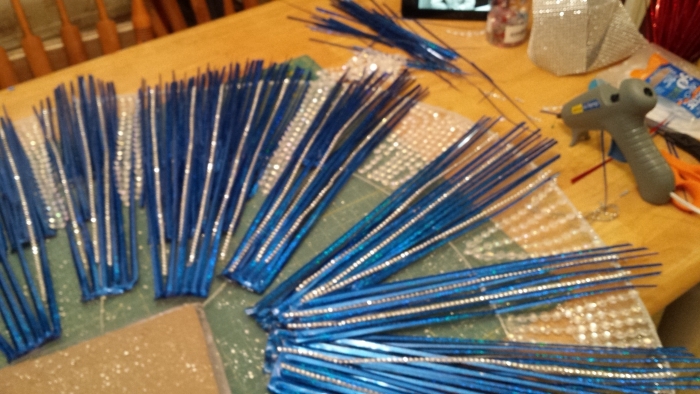 These beads are going to be perfect for the crystal "waterfall" I am creating for a shower. They came quickly and everything was packaged very well. I wasn't sure what kind of quality product would arrive, but the diamond iridescent beaded curtain is as beautiful, if not more stunning as the pictures show and when it comes out of the box...way above the quality I expected, and it arrived within less than a week! I bought these curtains to separate one area in my living room, everyone says it looks super nice! .... Also the customer services is amazing! My intention was to hang this from a window, not a door. Customer Service said you could cut the rod to fit. I needed 5 ft wide so I bought two three foot wide curtains. Well, the rods were kind of ugly white and just didn't match the beautiful beads. It was difficult to remove the end caps on the rods (they are glued in place) so I could extract the internal parts and cut everything to fit. 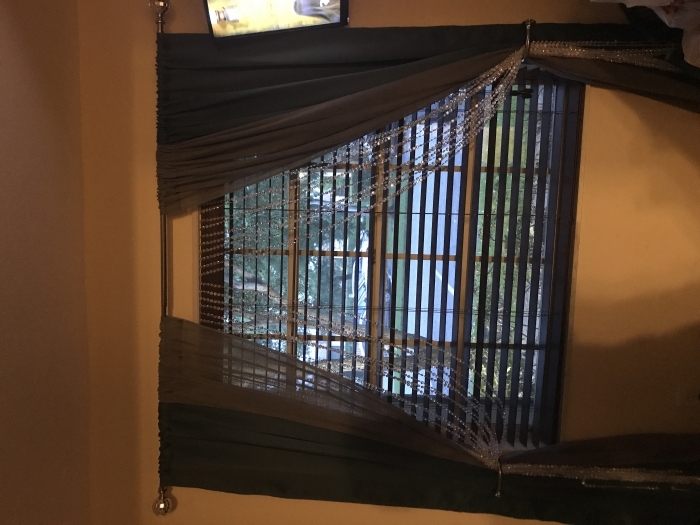 In the end, I threw the white rods in the recycle bin, used silicon adhesive to glue the internal hanger to a decorative piece of wood (it now matches the window frame) and rehung the bead strings. Now it looks awesome. ConsUgly white curtain rod. Maybe you should just make a kit that one can assemble for custom fit projects?? They were perfect and pretty. Made my event stand out.